We are what we eat! Food affects mood and performance more than we’d like to acknowledge. Most of us now live rather busy lives and food, even if prepared at home, is often made in a rush and eaten at an even faster pace. We tend to settle for easy and available stuff rather than quality and health. Take a moment to think about what you eat and how it makes you feel. How do you feel after you eaten fruits, or a handful of almonds or a good balanced meal consisting of high-quality proteins and vegetables and carbohydrates eaten at the right time? Compare this feeling with how you when you’ve been drinking copious amounts of caffeine and sugary sodas and loads of fast food? I know from experience, that when I was working the caffeine, sugar and pizzas while perking me up for a short while, did nothing to improve the quality of my work or how I felt. On the contrary, when I took the trouble to take home-cooked food to the office, I felt and worked considerably better. 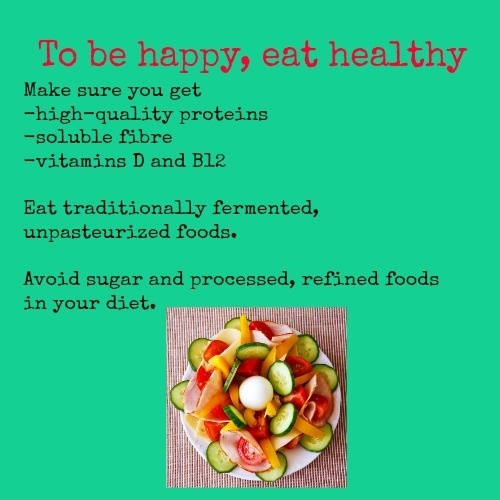 Foods that contain soluble fibre – barley, brown rice, pears and peas. By slowing the absorption of sugars into your bloodstream, soluble fibre prevents mood swings and keeps you on even keel through the day. Proteins slow the absorption of carbohydrates and thus keep you in a good mood for several hours after eating. Some sources of good proteins are – eggs, yogurt, poultry and seafood. Studies show that Vitamin D (low-fat milk, soymilk and egg yolks) might prevent SAD (seasonal affective disorder) and other mood disorders, while Vitamins B+ (salmon, cottage cheese) and Folate (oatmeal, lentils, broccoli) might prevent depression. Avoid foods with high sugar content and processed and refined foods. Attempt to include fermented food like lassi (Indian butter milk) and fermented vegetables (such as sauerkraut) to improve gut flora (read an interesting study on this here). As lay people, we can only guess what pesticides and fertilizers that are used to grow vegetables and fruits must do to our mood and performance when we ingest them based on increased allergies and illnesses. For meats and poultry we need to know that livestock have been raised in healthy, humane environment and are not pumped with antibiotics and growth hormones. Click here to read more about this. It’s important that we should be aware of where our food is sourced from and that we buy from outlets that share this information clearly. I’ve talked at length about No.3 – how we are eating – in my post on mindful eating. Eating slowly and mindfully will certainly put you in a better frame of mind. Eating slowly and chewing the food well makes it easier for digestion. Ayurveda had clear guidelines food to be eaten in different seasons. The post is very thoughtful and important. If we eat healthy food we will remain healthy. I completely agree to this!! I stay away from processed food as much as possible..
A happy tummy = a happy me! As far as HOW you are eating, a wise man told me “Eat by candlelight and soft music.” It slows down the whole process and is much healthier. Of course, he didn’t live in the real world, but he had a point.